- As Steel Rod : Diameter 12 mm. - Fill Diameter : 0.3 mm . - Face Wide : 750 mm. - Trim Length : 30 mm. 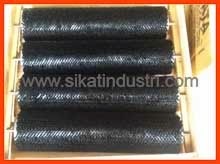 Related Products : Roll Brush, Roller Brush, Cylinder Roller Brush, Cylindrical Roller Brush,Cleaning Roller Brush, Conveyor Roller Brush, Printing Roller Brush. Diameter 4" 6" 8" 10" 12"